My high school had an award-winning music program. I know this, in part, because I was the only one of my friends not in one of its many bands and ensembles, having given up the clarinet owing to complications arising from an acute case of brace-face. School fundraising went almost exclusively toward an event so important it was capitalized: Band Trip. This was a national competition; ours were among the best musicians in the country. Music featured prominently in school and public life, from assemblies and sports, to city concerts. Those of us with harp-strings across our teeth rather than our fingers, with grunge rather than jazz in our ears, were appreciative listeners and admirers. We bought tickets, ate chocolate bars and ordered Florida oranges to finance their cross-country treks. We did our bit. Being out of pocket these small sums was rewarded by the tales my friends returned with—the stories of drunken chaperones, who made out with whom, which unfortunate attendee missed curfew, hot tub hijinks—as much as the hardware adorning the school trophy cases. It was easy to swell with pride, an orchestra of emotion. This was our high school, and it had an award-winning musical program. One of its first annual performances was the Emerson and Jacobson choral arrangement of John McCrae’s “In Flanders Fields” on November 11th. If you’ve ever heard it, you are hearing it again now: haunting, elegiac. Like most choral music, it insinuates itself into flesh and bone, borne by and for the spirit within. But therein lies the concern one might have with the song, or the poem upon which it is based. The words are intended to move, to be moving, and the song so perfectly captures this. The body responds involuntarily—a shiver in the spine, the hairs on the neck, the flush of the loins. This is its home, and its intended home. It is not, and never was, a poem fancied by the intellect. That it has since become arguably the most recognized of all English-language First World War poems, and by a Canadian poet at that, stirs a still more impassioned response. On any November 11th, it is the centrepiece of a national act of communion as it is recited from coast to coast, by principals and school children, by veterans and dignitaries, and on Youtube as at the National War Memorial. In those minutes of silence between a trumpet’s funereal notes these words vibrate at a primal frequency, and who would dare question them? Who could doubt the righteous cause of those who suffered for us? Well, we all can. And perhaps we really should, because McCrae’s words evoke a paradoxical presentness of past values. Take up our quarrel with the foe. This is a command to continue their agenda, girded by impassioned poesy, and hidden behind a veneer of honouring one’s ancestors. As though all ancestral thoughts and practices were of equal value. As though there is no place for reflection, just action. It is, perhaps, “active history” in the wryest sense. This December, 2015, John McCrae’s “In Flanders Fields” turns 100 years old. Knopf Canada has recently published a collection of retrospectives on the poem by some of Canada’s most celebrated persons and authors: politicians, as well as fiction writers and historians. While there is much to admire in a number of the essays, collectively many of them display an alarming nostalgia about the poem’s sentiments, and McCrae’s corresponding ideals, often given in banal concluding remarks that belie a complex context. But complexity requires thought, and as mentioned already, the poem itself urges movement and activity, delivered from a state of unrest. In reflecting on a poem about doing, too many authors acquiesce to instruction. To be clear, not all authors do this. Margaret Atwood’s now-canonical “Poppies: Three Variations” is included here, and is certainly not of this ilk. Mary Janigan’s essay on the poem’s use during the Conscription Crisis of 1917 is also distinctly anti-nostalgic, and is discussed below. Joseph Boyden offers a life-affirming tale of his travels to Flanders, of simultaneously honouring the past but living in the now. It is this issue, precisely, that is troubling in many careless expressions of nostalgia: honouring the dead is too easily conflated with accepting their outdated ideals. The first essay, and place of privilege, goes to Roméo Dallaire: former commander of the United Nation’s Rwandan peacekeeping mission, and a man psychologically condemned nightly to reliving the genocide he witnessed firsthand. In spite of that personal history, Dallaire advocates for warring against war—in short, an “old Kant” routine of self-serving ideology. In so doing, he disparages all who refuse to endorse military missions as shirkers mired in “self-protective ignorance” who merely “hope and pray” for an end to global conflict. Ultimately, he praises McCrae’s sentiments that all should “join the fight and stop the perpetrators of this most barbarous murder.” It is a staggering equivocation, of Imperial Germany to Hutu extremists, accepting with ease century-old, anti-German, British propaganda. Perhaps most tragically, while praising McCrae’s particular brand of British imperialism, Dallaire side-steps the inconvenient truth that his own albatross is a direct consequence of that same British attitude. Dallaire concludes by suggesting that today McCrae “would find powerful language to inspire our commitment to the prevention of conflict.” It is a shocking untruth, the very next essay, by Tim Cook, confirming McCrae’s nakedly pro-British, imperialist sentiments. 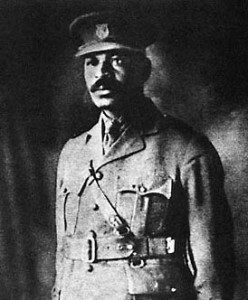 In Cook’s words, he was a man of his time, raised on its ideals of martial valour, military adventure, and imperial service. Additionally, as Mary Janigan describes, McCrae crowed about his poem being used to fan antagonisms between French- and English-speaking Canadians during the Conscription Crisis of 1917. McCrae was quite evidently a typically Anglo exceptionalist who had no trouble at all antagonizing others and inflaming conflict, casually assured of his and the British peoples’ righteousness. That McCrae believed in his causes, as both Cook and Jonathan Vance write in their respective essays, is a perfectly reasonable historical claim. In retrospect, however, one must always ask if those ideals are still useful for today’s world? Ken Dryden, another Liberal ex-politician, speaks of the importance of creating traditions by passing the torch to subsequent generations, as McCrae urged. In this case, he reflects on the fact that Frank Selke placed McCrae’s words—“To you from failing hands we throw / The torch; be yours to hold it high.”—on the Montréal Canadiens’ dressing room wall. In the essay, Dryden speaks of high-minded ideals, of the duty of the past to the present, present to future, and vice versa; it is a commendable representation of the non-linear path of time. But in so doing, like Selke before him, he conflates war and sport and correspondingly, Empire and Team. What of the darker side of tradition and group identity? What of rivalry, difference and isolation? What of enmity? If we are the dead, and the sum total of their ideals and experiences, then we are these darker things, too. Patrick Lane, describing a childhood experience in which his mother, the wife of a traumatized Second World War veteran, announced that “we are the harbingers of death,” only hints at this darkness. We murder and kill in the name of these dark things; we tacitly accept our own demise, physical and psychological, in so doing. And yet Lane, like others, claims it is not his right to question McCrae’s pathos. He claims it is personal, being McCrae’s attempt to create something beautiful out of the rudeness of organized murder. This would be true had McCrae not demanded us to “take up our quarrel with the foe,” or if he weren’t proselytizing about not breaking faith in this endeavour. But he did. Moreover, he never appears to have objected to its use in any causes, commercial or partisan. Perhaps one can rationalize his notion of sacrifice, but does it work for today? 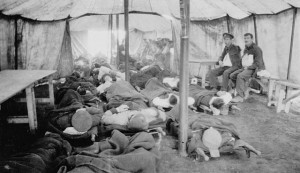 As Kevin Patterson rightly points out, “death was much closer to the average person then,” given high mortality rates among children and young adults and a dearth of accessible health care, thus “[saying] much about how a death-spewing war could be embraced so unflinchingly.” On a personal level, Patterson also rightly points out that the call to action is the call of the battlefield surgeon: there is no time to think, only time for doing. War time conspires against reflection. Yet it is a temporal conspiracy from which we have been extricated, in no small part thanks to the abundance of caretaking ideology that has since filtered through most levels of Canadian society. McCrae might even have been emblematic of that shift, as a physician. The challenge here is that he was in his mind a soldier first, Hippocrates trumped by Ares. In light of all of this, it becomes exceedingly hard to tell what Wade Davis means when he writes, as a point of praise, that McCrae’s generation’s “words and deeds will endure as a testament for the ages.” Which age, and for whom? Again one encounters McCrae portrayed as the embodiment of a generation to be admired for their commitment. By promoting McCrae’s ideals, heartfelt though they were, we are at risk of maintaining the glacial pace of history and ensuring an unfair, and frequently unjust, burden of the past on the present. By venerating some but not others, we exclude and by process of exclusion, risk reifying not only the quarrel with some unnamed “foe,” based in rival tradition and difference, but even making a foe of ourselves in the eyes of others. Perhaps worst of all, we make victims of countless innocents when war is waged, and thus requiring a strong reminder that “accountability to the dead has a dark side,” as Hannah Moscovitch remarks. Moscovitch brings us back to Dallaire’s haunted dreams, and to what I perceive as a tragic inability to see how Dallaire’s own trade continues to create its own victimhood. Blind adherence to the message does not help us confront such challenges. My high school had an award-winning music program. Every year the trophies got polished and new recruitment began. Only months and years later does one decide that, far from being funny, adults giving booze to children in a strange city far from their families is seriously fucked up. Or that maybe one of the makers-out was too intoxicated to consent—and probably both were. Or that the kid who missed curfew got lost coming back from an outing, through no fault of their own, and spent the remaining years of their schooling labeled a trouble-maker by teachers and colleagues alike. Or that the strange older man making lewd comments about “swelling with pride” to teenage girls in a hot tub is criminal. And of course there was the performance anxiety, 5 a.m. wake-up calls, fear of losing one’s hard-earned seat, burnout and addiction. In the narrow corridors of our school, no dust was allowed to settle on this past. It isn’t easy to consider Band Trip in retrospect, but it is necessary in order to reflect the person I am today, the society in which I live, and the values bound up in both. This was Band Trip. Now imagine what one must do with War. Christopher Schultz is completing his PhD at Western University, where he is writing on the civilian identities of Canadian First World War soldiers on active service. Based in Ottawa, Christopher is a series editor and co-creator of “Canada’s First World War” on ActiveHistory.ca, and is also the creator of Telling Schtories, a weekly Youtube current events series. 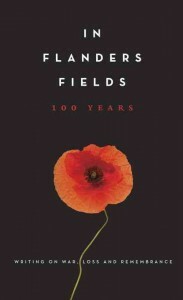 Amanda Betts, Ed., In Flanders Fields 100 Years: Writing on War, Loss and Remembrance (Knopf Canada: Toronto, 2015). The authors are: Margaret Atwood, Joseph Boyden, George Elliott Clarke, Tim Cook, Wade Davis, Roméo Dallaire, Ken Dryden, Frances Itani, Mary Janigan, Patrick Lane, Hannah Moscovitch, Kevin Patterson and Jonathan Vance. Joseph Boyden, “Three Tours of Flanders,” In Flanders Fields: 224. See Friedrich Nietzsche, Beyond Good and Evil, in Basic Writings of Nietzsche, Trans. and Ed. by Walter Kaufmann, Modern Library Edition (New York: Random House, 2000): 201-4. In these sections (SS 3-6), Nietzsche argues that Kant’s, like all philosophizing, and particularly those claiming to be rooted in reason or a priori meanings, attempts to establish its mastery over all others. Philosophizing, like one encounters in Dallaire, then, is an act of self-preservation that is reasoned after the fact in the name of establishing a nebulous, but noisy sense of truth. Roméo Dallaire, “Those Who Serve,” 7. Dallaire, “Those Who Serve,” 3. Tim Cook, “Forged in Fire,” 18. Mary Janigan, “Treason to Their Memory,” 78. Respectively in Cook 54; and Jonathan Vance, “A Moment’s Perfection,” 205. Patrick Lane, “The Wars,” 63. Kevin Patterson, “Soldier Surgeon, Soldier Poet,” 120. Wade Davis, “Of War and Remembrance,” 168. George Elliott Clarke, “From the Diary of William Andrew White,” 228-9. Emphasis in original. Clarke 233. Emphasis in original. Clarke 230. Emphasis in original. Hannah Moscovitch, “Writing About War,” 241-2. “a care taking ideology which has since filtered through Canadian society” This self congratulatory point as a counter to the assertion of McCrae’s view as ‘action over reflection’ can surely be questioned. Our present Canada has no restriction on abortion on one end of life and assisted suicide on the other. My point being that death on both ends of life is accepted without much question. Our present society may indeed have blind spots of its own much as the essayist correctly points out McCrae’s age had. What will be written of our present Canada’s unexamined assumptions in 100 years time?